Phoenix is Arizona’s capital, largest city and located in the middle of the Sonoran Desert. Despite living in this rather arid area, residents love living in Phoenix because in a few short hours they can go skiing up north, swimming in the Pacific or eat tacos south of the Mexican border. For these activities, of course, there is a lot of equipment to buy, use and store. Wake boards, skies, snowboard, bicycles along with motorcycles, inline skates and golf clubs all demand sufficient and appropriate space. And just when was the last time you were able to park your car in your Phoenix garage?- Exactly! Most Phoenix garages are clutter and obstructed with objects that divers family members have inconveniently dropped wherever. If you are tired of having to dig through the mess to find your drill bits or having to get into your hot car, because it has been sitting outside in the hot Arizona sun, then you might want to consider having Barefoot Surfaces give you garage a stylish remodel by adding fantastic garage cabinets to store away (and hide) everything you do not want to see upon entering your garage. Our Phoenix garage remodel team has been providing superior garage solutions for many years. Ric Ramirez, owner of Barefoot Surfaces has years of extensive experience in remodeling garages. He enjoys transforming garages in beautiful, well-organized and useful spaces. Our Phoenix garage remodel experts will sit down with you, get to know you and devise the perfect remodel plan for your garage. We will handle the entire process, from the first consultation to the final walk -through, we want you to be truly happy with your garage storage solutions. We are proud to be an authorized retailer of Slide-Lok garage cabinets. For the best remodels, you have to work with quality products. We love Slide-Lok because they use durable plywood, not that cheap particle board you see some of the others use. Our trained Phoenix garage remodel experts can assist you in selecting the garage cabinet system that works with your garage. You also have the choice between the Classic or the Tech series to ensure you get the look you love. You can even customize your cabinets with added drawers or shelves. You do not have to live with a garage that looks more like a disaster zone than a place to park your car. Our cabinet solutions are stylish, low maintenance and affordable. Keep your tools in their assigned place, skis out of sight and away from unauthorized access. Additionally, Phoenix garage cabinets can ensure protection of your valuables from pests or the elements. To learn more about our remodel process and the variety of options available to you, contact Barefoot Surfaces today-and park your car in your garage tomorrow! 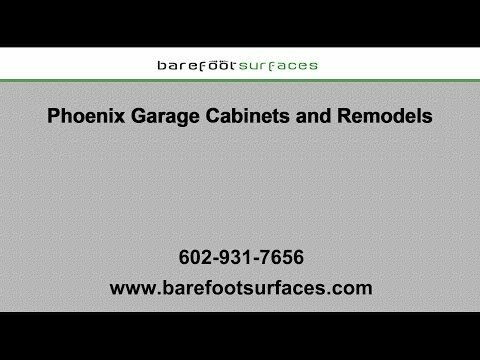 Barefoot Surfaces is your partner for Phoenix Garage Remodels and Cabinet Installations. To enhance the look of your garage further, ask us about our Phoenix concrete floor coating solutions. We have over two decades of experience in the industry and gladly will meet with you to discuss the best course of action to make your garage the beautiful and useful space it deserves to be. You can reach us by phone at 602-931-7656 or email Ric at Ric@barefootsurfaces.com.